Plans to reduce rising emissions from global shipping have faltered at a key international meeting. The International Maritime Organization delayed a decision to raise the cost of ships' fuel and use the money to help poor nations tackle climate change. Delegates from developing countries complained that rich nations had reneged on other promises. Environmental groups criticised the lack of progress, saying that the world could not afford to wait any longer. When the Kyoto Protocol was agreed, the shipping and aviation sectors were left out because no-one could agree on how the emissions should be allocated. The International Maritime Organization (IMO) was given the task of finding a way around the problem, but there has been little progress to date. This week, the IMO's Marine Environment Protection Committee did agree draft technical measures to improve the efficiency of ships' designs. 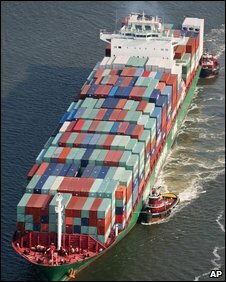 It also agreed on ways to improve the efficiency of shipping operations. However, the meeting did not make any progress on the idea of raising the cost of ships' fuel in order to help poorer nations deal with the consequences of climate change. Environmental groups are frustrated over what they see as a lack of meaningful progress. "The global shipping industry emits a billion tonnes of CO2 [per year], and that number is on course to double or even triple by 2050," said Peter Lockley, head of transport policy at WWF. "So far, there is not a single policy in place in the world to limit those emissions," he told BBC News. "This week, we have been trying to discuss ways in which we can. "They have made some progress on technical measures but there is still going to be nothing that is compulsory for shipping owners." Rich nations say they do want a deal that puts up the price of fuel, but some key developing countries are angry that the wealthy states have not delivered on their side of the bargain. The issue of a fuel levy is likely to be discussed again in the autumn during the full meeting of the IMO.